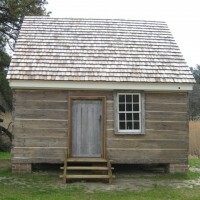 The Captain Timothy Hill House is a rare surviving example of an early nineteenth century plank-wall house and possibly the oldest surviving house on Chincoteague Island. It is also one of the few surviving houses in Virginia which at one time had a wooden chimney. The house was owned by Timothy Hill during the early-to-mid-nineteenth century and it was during his ownership that the house gained the features which represent its current style and detailing. The house was constructed using pit sawn and hewn pine planks secured at each corner with original dovetail joints. The house retains some historic flooring, interior wood trim, paint, chinking, two historic doors, and an historic mantle. 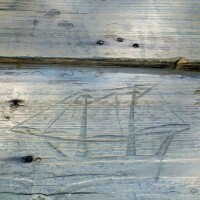 There are over thirty nineteenth century carvings of ships on the exterior of the house. While simple outlines, the images accurately convey the details and proportions of period sailing vessels such as schooners and sloops. The house was found to be significant under Criterion C (Architecture) as an extremely rare resource type. The house is well documented through local histories and records and represents an excellent example of early seafaring life on the Eastern Shore of Virginia.